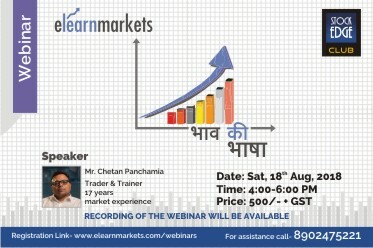 Elearnmarkets brings to you a webinar which will be conducted in Hindi. All those who wants an in-depth understanding of prices and its direction in financial markets, this webinar is the right choice! This session will focus on the importance of prices and how it is the primary and the most important factor in determining the direction of the markets. The understanding of price is the key to success in stock market trading and investment. This webinar will help you learn, to read the market well so that you can predict the market trend well before it actually takes place, with the help of analyzing price and volume through Technical analysis. Trading and Investment strategies using proper money management techniques will be discussed in this session which will help you take one step forward to achieve your financial goal. The objective of this webinar is to see and understand the market in a holistic way with importance given to price pattern. Understanding of the market psychology and the shifts between buyers and sellers. Make smart investments by identifying proper trends in the financial market. Identifying potential tops and bottoms in a trend by means of different chart patterns. Decide proper entry and exit points in your trade and other trading strategies with the help of support and resistance. Learn proper money management techniques to achieve desired risk reward ratio. support and resistance and the ability of market players to share the entry and exits.